Would It Be Smart to File Under Chapter 13? The Basics of a Chapter 13 Bankruptcy in Wyoming. A Chapter 13 bankruptcy reorganizes your debt into manageable monthly payments. In a Chapter 13 bankruptcy, your outstanding debt is paid in accordance with the terms of the Chapter 13 plan that you file with the Bankruptcy Court. Your plan will have a duration of three to five years, but in some cases, the plan’s duration, as a practical matter, is less than three years. The amount you pay each month is determined by your monthly disposable income. In Chapter 13, households with a high monthly disposable income, the monthly plan payment may be may be less than the amount of the monthly disposable income, if the plan proposes a 100% payment on all debt filed by a set deadline and approved by the Bankruptcy Court. The Wyoming Bankruptcy Court will not order you to pay more than you can reasonably afford each month, but at the same time, you will not be allowed to include in your budget payments for non-essential expenditures such as college expenses for children, boats or off-road vehicles, or a third vehicle. In Chapter 13, your bankruptcy discharge is entered after your final plan payment, and your non-exempt assets do not have to be purchased back or turned over to the Chapter 13 trustee. In contrast, a Chapter 7 bankruptcy involves buying back or turning over your non-exempt assets to the Chapter 7 trustee, but it does not involve monthly plan payments. In Chapter 7, a discharge order eliminating your dischargeable unsecured debt is signed two months after your meeting with the Chapter 7 trustee. In Chapter 13, your discharge order is entered after your last plan payment, which usually takes 3 to 5 years. A Chapter 13 bankruptcy is an excellent option if you do not qualify for Chapter 7 under the Means Test. Chapter 13 is clearly preferable to suffering through repeated wage garnishments, a vehicle repossession or a foreclosure on the family home. These types of actions must immediately stop when a Chapter 13 bankruptcy case is filed. Does Chapter 13 Have a Technical Side? Yes, Chapter 13 combines dynamic and fluid mathematic calculations with obtuse language from the Bankruptcy Code and with Bankruptcy Court decisions construing the Bankruptcy Code. As a result, Chapter 13 cases can be complex and technical. For this reason, Chapter 13 cases should be managed under the guidance of an experienced and competent Wyoming Chapter 13 bankruptcy attorney. You should choose a Wyoming bankruptcy attorney with a proven track record of success in Chapter 13 cases. A short description of the concepts that contribute to this complexity are mentioned below. The Means Test, Median Income and Six Month Lookback. Chapter 13 requires that you filed a plan of reorganization and that it be approved by the Bankruptcy Court. This is referred to as confirmation of the plan. To be confirmed, the plan must propose paying all household monthly disposable income to the Chapter 13 trustee for the duration of the plan’s commitment period. The commitment period can be as short as three years or as long as five years. Monthly disposable income is defined by the Bankruptcy Code as the income left over each month after paying the household’s necessary living expenses. Allowable necessary living expenses include: i) ordinary living expenses such as medical care, transportation costs, utilities and rent, ii) secured debt payments on property to be retained, such as a home or a vehicle, iii) payments on arrears for secured debt payments that were delinquent before the bankruptcy was filed, and iv) payment of past due child support and tax obligations. Allowable living expenses do not include payments on unsecured debt, such as credit cards, medical debt and deficiencies from repossessions or foreclosures. Payments on this type of debt are made by the Chapter 13 trustee with the funds accumulated from the plan payments. The amount paid on this type of unsecured debt is determined by the terms of the confirmed plan. Depending on the amount of the monthly disposable income and the amount of this type of unsecured debt, repayment of this type of unsecured debt may range between 1% and 100% of the total amount owed. The Bankruptcy Code does not require repayment of a specific percentage of your unsecured debt. Instead, it requires payment to the Chapter 13 trustee of all of your monthly disposable income received over the commitment period. In calculating monthly disposable income, you are given reasonable allowances for necessary living expenses. When the total monthly payments paid over the commitment period are divided by the total amount of unsecured, non-priority debt, the repayment dividend to the unsecured creditors is expressed as a percentage, which may fall anywhere between 1% and 100%. Debtors whose household gross income is below median for the same sized household in Wyoming will have a three (3) year commitment period in Chapter 13. Debtors whose household gross income is above median for the same sized household in Wyoming will have a five (5) year commitment period. Whether your household is above or below median is determined by calculating you Current Monthly [Gross] Income (CMI) and comparing it to the median gross income figure for the same size household in Wyoming. If your household’s CMI is above median, then you are required to complete the second part of the Means Test to determine the amount of your monthly disposable income. The second part of the Means Test is the same as the expense side of a household budget ledger. Most of the figures for the second part of the Means Test are determined from Census Bureau information, but some of the figures are determined using the household’s actual expenses. The Census Bureau figures are usually more than adequate to ensure that the household is receiving fair expense allowances. Below-median households are permitted to file under Chapter 7 but may choose to file under Chapter 13 because of a prior Chapter 7 bankruptcy filed in the last eight (8) years, equity in the family residence that is greater than the homestead exemption allowance, curing a default on a residential mortgage that is past due or about to be foreclosed, protecting a family member under the Chapter 13’s expanded stay provision, and discharging some types of debt that cannot be discharged in Chapter 7. Above-median households are required to file under Chapter 13. The period of time used by the Means Test to calculate whether debtors are above or below-median is the period that is the last six full calendar months immediately preceding the filing of the bankruptcy petition. This six month period changes by rolling forward with each new month. As a result, some debtors who are slightly above-median may benefit from timing the filing of their bankruptcy petition to coincide with a period of reduced wages that places them below-median and eligible to file under Chapter 7. In today’s economy, more and more Wyoming families are not keeping up with monthly bills and household expenses. Unexpected events, such as a sudden illness, a debilitating injury, a family emergency or a job loss can leave a family struggling financially. If you are one of the thousands of Wyoming families buried in growing debt, it may seem there is no end in sight. Fortunately, there are ways in which you can work towards resolving your outstanding debts. An Experienced Chapter 13 Bankruptcy Attorney in Wyoming Can Help. If you need help managing your debt and steering a new financial course, you’ve found the right law firm with Arnold Law Offices. Years of bankruptcy experience and more than 2,500 bankruptcy filings has allowed Mr. Arnold to be recognized by his peers, Judges and rating firm of Thomson Reuters as a Super Lawyer. This places Mr. Arnold in the top 5% of consumer bankruptcy attorneys in the Intermountain West. Arnold Law Offices has filed hundreds Chapter 13 cases in Wyoming and has an excellent reputation for succeeding with even the most difficult Chapter 13 cases. Mr. Arnold’s Chapter 13 clients have one of the highest rates of plan confirmation and completion of plan payments. Mr. Arnold and Arnold Law Offices have helped families and individuals take back their lives by using Chapter 13 to work toward a future that is debt-free. 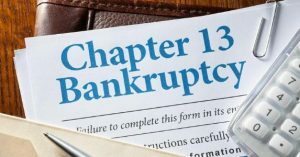 1 What is a Chapter 13 Bankruptcy? Would It Be Smart to File Under Chapter 13? 1.1 The Basics of a Chapter 13 Bankruptcy in Wyoming. 1.2 Does Chapter 13 Have a Technical Side?